MIL's relatives visited from China so I roasted a turkey. It's an early Thanksgiving dinner I suppose. Turkeys are totally uncommon in China and I thought my guests were pretty happy until one of them said, when going out the door, "If I were cooking the bird, I'd add some soy sauce, some chili flakes and just more salt, you know." I suppose you can, I said. With the leftover turkey, I made PW's chicken pot pies from her book The Pioneer Woman Cooks because she made them look rustic and not too advanced on the cooking scale. I love pies but the thought of making the crust just puts me off. Turned out that PW's pie crust is not only perfect--short, flaky, delicious--but also perfectly easy to make. There's no way it won't be perfect because there's so much shortening in it, 3 cups flour to 1 1/2 cups shortening. I replaced 1/2 cup of the shortening with butter and the pastry was still good. PW insists on using Crisco and no butter for that perfect flaky pastry. I made a second batch using Crisco only and it was the same as the one with butter but I'll still take PW's advice and use Crisco only because I couldn't tell the difference between the two pastry in terms of flavor. Fat is 9 calorie per gram so I made a large pie without a base (pot pie) so that there's less pastry to eat and then with the leftover filling and pastry, I made little pies that I can freeze. PW's pie crust is better than that in my chicken and leek pie recipe and my lattice-top apple pie recipe. I think the difference, besides the higher amount of shortening, is that the dough is not kneaded at all. That sort of negates everything about fraisage in my apple pie crust recipe but then again there's water added to that recipe to make the pastry strong enough to weave. PW's pie crust pastry is too short for weaving but is perfect for both savory and sweet pies and tarts.You can see how she makes the crust step by step here. My son Wey devoured the pie. I thought that it was a little bit too watery and not creamy enough. I also don't like celery in my pies. 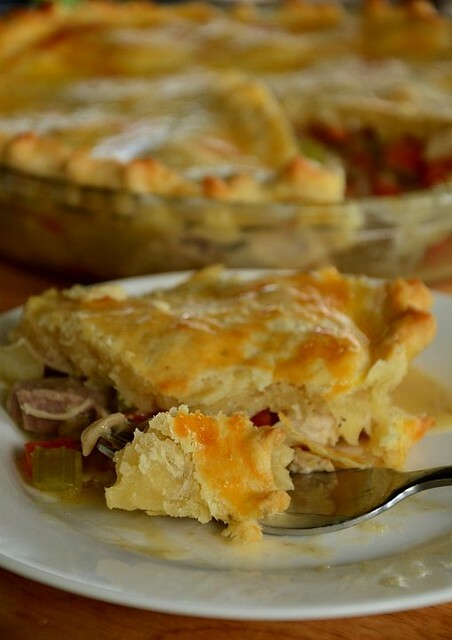 I'm still searching for that elusive chicken pie recipe that will remind me of the chicken pies I ate at Max's Coffee House (I think that's the name) in Kampung Air in the 70s. Max's was the only western cafe and going to Max was a real treat. The pies at Max's were always served with a bottle of Lingham's sweet chili sauce. Absolutely heavenly. Have you ever wanted to eat something that reminds you of your childhood and then when you eat it, years or even decades later, it's not as good because your standards are different now? I suspect that probably it's the memory of swimming in the sea in Kampung Air and then eating at Max's when I had extra money that make me crave for them. In the recipe below, I've increased the amount of chicken/turkey and flour to get a thicker gravy. I don't like celery in my pies so I've replaced that with mushrooms. I also added a bit of garlic and my favorite gravy flavoring, Harveys Bristol Cream Sherry for that oomph. 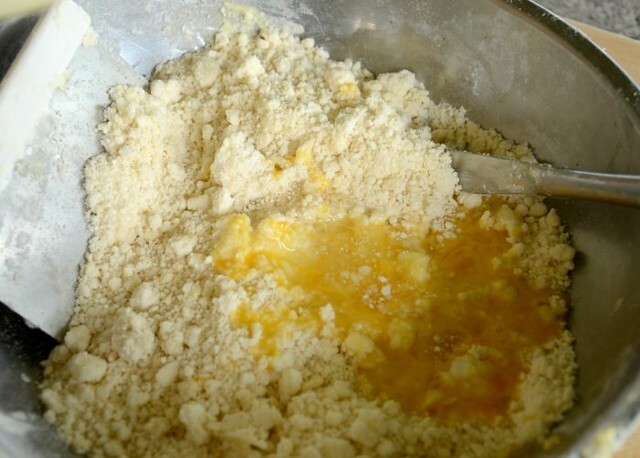 Add the beaten egg to the crumbly mixture of flour, salt and shortening. Add the ice-cold water and vinegar, stir to mix well. Finally, do not knead, just gather the dough together into balls. If you are rolling directly on the work surface, flour it first. PW's Perfect Pie Crust IS perfect: light, very short and delicious. And super easy to make. 1. 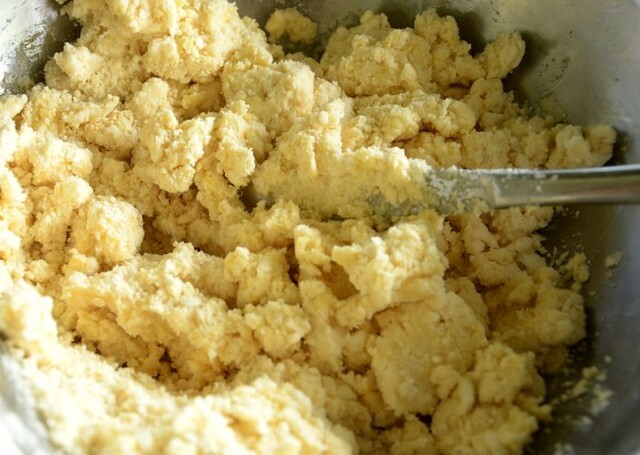 Melt butter in a large pot over medium heat. Add the onion, garlic, mushrooms/celery, carrots and saute until the veggies turn transparent. Add the peas, then the chicken/turkey and sprinkle the flour over, stirring to combine. Let mixture cook and bubble for two minutes, then add the chicken stock and stock cube. Now add the cream and mix well. Cook over low heat until mixture thickens, about 4 to 5 minutes. Season with the sherry, herb, salt and pepper to taste. 2. Pour the mixture into a pie dish, level. 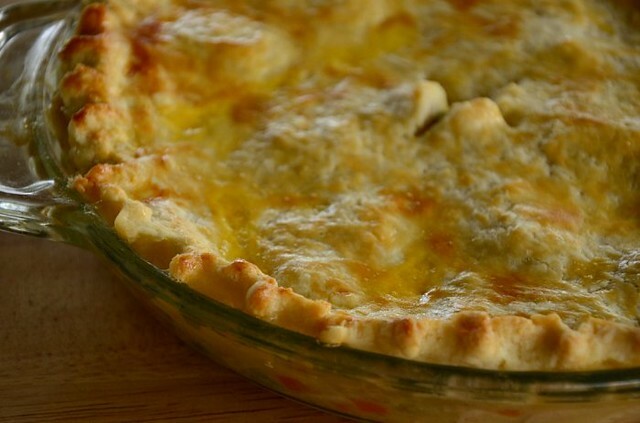 note: this recipe will make more than 2 x 9"/23cm pie crusts for pot pies (i.e. no base) but to make 30 small pies, you need 2 times the recipe amount. 1. Put the salt (I add this now to get it evenly mixed in but PW adds it with the vinegar), flour and shortening into a large bowl and use a pastry cutter to cut the shortening in until the mixture is coarse-crumbly. 2. Beat the egg and add to the flour mixture, stirring to blend egg in. Pour the water over and then the vinegar (in a large circle) and use the pastry cutter to mix well. Gather dough together; no need to knead. Chill the pastry for 10 minutes. 3. 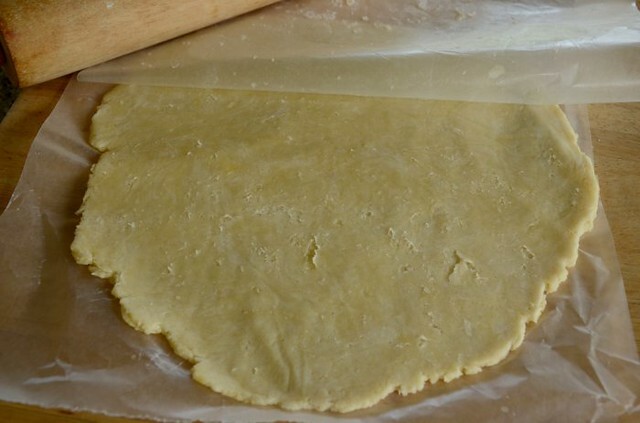 Divide the pastry into two, roll each between plastic sheets. 2. Scoop filling into two 9"/ cm glass pie dish to the rim. Use a rolling pin to roll the crust larger than the pie dish and transfer the pie crusts onto the pies with the rolling pin. Brush the crust with the egg wash. Make decorative edges, snip a cross in the middle to let steam out. Brush with egg wash and bake 25 to 30 minutes. 2. Roll pastry out, cut into circles large enough (I used a large ring cutter) to fit the muffin cups to the rim. Put some baking weights or beans (I used soy beans) on the base of the pastry and bake 10 to 12 minutes. 3. 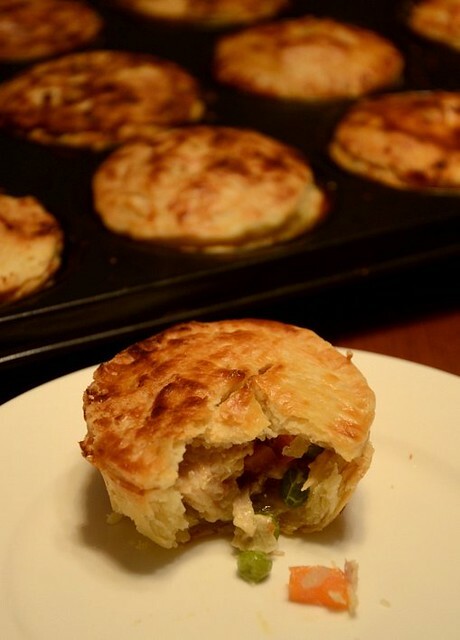 Remove muffin pans from oven, fill the muffin cups with the filling and cover with a circle of pastry. Pinch the edges of the top and bottom pastry together and use the tines of a fork to press a pattern around the edge. 4. Brush egg wash on the tops of the pies, snip a cross with scissors in the center and bake 20 minutes. The small ones look really cute! More crust-to-filling ratio which is what I like. Is that a 3-inch diameter? Could you let us know how long to bake them for, and at what temperature? Did u hv to prebake the base pastry of the muffin-sized pies? Wow!! I like Pies, too!! John cooked Steak and Ale Pie on the Bonfire Night (5th of November) and it was great!!! My pie crust doesn't have eggs in them, really keen to try that out and see the difference it makes! the pie looks lovely! Hi! You make it sounds so easy, perhaps I'll give it a try. Agreed with you that foods that we craved ages ago do not taste as good now, probably due to our standard has changed, haha! yummy. just made an apple pie yesterday and when I logged onto your blog I saw this. I am definitely going to try it this weekend. BTW, can I substitute the crisco for something else like butter? Oooo... your pies made me so hungry!! Again, I gotta try this and I am very sure it will be awesome!! Awesome. I miss a good turkey pot pie. Where did your turkeys come from? jasmine: sorry i left tt out. i used a muffin pan, baked at 200 C for 20 minutes but prior to tt, i baked the pastry blind to dry it out. laura: steak and ale pie sounds yummy. wow john's a keeper! aiko: why not? turkey's yummy! shuhan: try it and tell me how your crust turned out. sharon: it really is easy to make and tastes great but just a bit too much on the shortening. runningbrook: PW said no, you have to use crisco. stick to her advice. crisco now comes transfat free. annie: turkey's frm the states. Norbest, very very good and fresh even though it came frozen. i would love a Butterball, haven't eaten one in decades! do you get turkeys in kuching? Also frozen turkeys from the States. Super duper expensive. We do without. hi where do i find Crisco in KK? anon: try Merdeka Supermarket. if none there, try Pelangi Cakeshop behind the Petronas station in Foh San.